What cannot be replaced by corporate chains is neighborhood character and variety. "Eiraku is the last surviving sushi bar in this cluttered neighborhood of steep cobblestoned hills and cherry trees unseen on most tourist maps of Tokyo. Caught between the rarified world of $300 omakase dinners and the brutal efficiency of chain-restaurant fish, mom-and-pop shops like it are fast disappearing. Chef Masatoshi Fukutsuna and his wife, Mitsue, smile without a word. In the 35 years since they opened up shop, the couple has seen many of their friends move away for a job or family, only to return decades later, often without the job or the family, their absence unspoken. Absence is a part of life here on what remains of the Medaka shopping street, a road so narrow that cars have to drive up onto the sidewalk to let another vehicle pass. Once the sky turns pink and the sun sets, the street descends into shadow, save for the faintest glow from halogen lamp posts. It's a neighborhood in twilight. More like it are scattered across this city, their corner cafes and stores far from the neon blare of the famous shopping districts. The number of independent, family-owned sushi bars in Tokyo has halved to 750 in the last decade, a trade association says, driven out of business by fast-food joints and a younger generation that doesn't want to inherit them. "People would rather pay 100 yen for a plate of sushi at a really cheap place or they'd shell out tens of thousands of yen to go to a famous sushi restaurant in Ginza that they heard about on television," says the chef, absentmindedly changing the channel of the TV. "But places like ours, shops that are right in the middle, we just can't seem to survive." 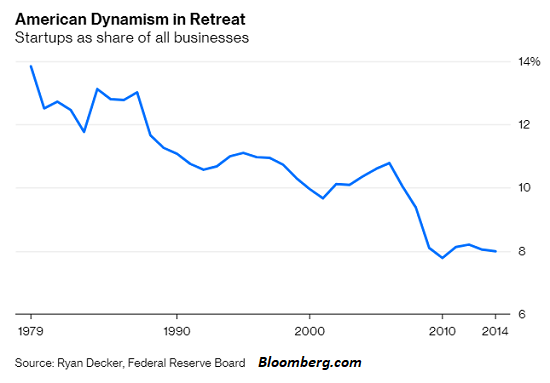 In the U.S., and presumably elsewhere, there are other financial pressures on small businesses: the complexity of compliance with the ever-increasing thicket of regulations is constantly increasing, as are taxes and fees as local government seeks to extract more revenue from the small-business tax donkeys. These increases in costs while revenues sag as customers seek cheaper chain meals or simply stop going out at all are a double-whammy. -- The loss of neighborhood character and variety, replaced by homogenized chains and lifeless shuttered storefronts. -- the loss of food that's been prepared by hand with real ingredients. -- the loss of neighborhood cohesion and social circles; residents who were once recognized as individuals and who belonged to loose but important social circles are unknown in faceless chain outlets. -- the loss of local employment. Employees in chain outlets commute from distant places, and their hours and locations may change, making it impossible to know local residents. -- the loss of walkable, interesting neighborhoods. What's there to explore or provide interest in a string of steel and glass chain outlets? -- the loss of local social gathering places. Once local neighborhood places are lost, people gravitate to McDonalds or similar chain outlets because McDonalds will not hurry customers away from its tables. In some cultures, the American fast-food outlets are attractive because they are clean, well-lit and class-neutral: they serve every customer with well-trained politeness: the service is as uniform as the food. The 2013 book Food and Culture: A Reader has an interesting essay by Yungxiang Yan about the social and class structure of McDonalds in China: Of Hamburger and Social Space: Consuming McDonald's in Beijing. The essay helps us understand why Western fast-food outlets have achieved such extraordinary popularity around the world: they provide inviting social spaces, not just uniform, consistent, reasonable-cost food. Needless to say, American fast-food outlets are engineered to provide these social-space and class/gender-neutral assets as well as carefully engineered menu selections; in many cultures, McDonald's offers women and a safe and acceptable place to gather and socialize. fast-food outlets are popular with students for similar reasons. My point here is not to say that fast-food outlets don't serve a positive social role; the point is what fast-food outlets provide is not a 100% replacement for what's lost as local Mom and Pop stores and cafes vanish. What cannot be replaced by corporate chains is neighborhood character and variety: once locally owned and operated businesses wither and die, the neighborhood looks like other every other redeveloped, homogenized street around the world. This is fine for those who want an anonymous, impersonal meal and table, but an anonymous, impersonal meal and table is now available from Beijing to Belfast in a monotonous uniformity of menus and spaces. What's scarce and thus valuable are not fast-food outlets; what's scarce and valuable are walkable, diverse neighborhoods of locally owned and operated stores and cafes which offer social refreshment and bonds as well as home-cooked meals. Thank you, Jeffrey N. ($75), for your humongously generous contribution to this site -- I am greatly honored by your steadfast support and readership. Thank you, Nathan G. ($5/month), for your superbly generous pledge to this site -- I am greatly honored by your support and readership.